Cardiomyopathy is known primarily as a disease relating to adults. But, if you have read my blog before, you know that I write about children’s chronic illnesses. Here I will be discussing this disease as it affects children. Cardiomyopathy is a chronic and progressive disease. The myocardium (heart muscle) becomes enlarged and thickened usually beginning in the walls of the ventricles (lower chambers of the heart.) With a more severe case, it would involve the atria ( the upper chambers of the heart.) The muscle cells and tissues of the heart become damaged. Eventually, the weakened heart loses the ability to pump blood efficiently and heart failure or irregular heartbeats (arrhythmias) can be seen. Cardiomyopathy is identified as either “ischemic” (involving hardening of arteries on the heart’s surface seen in the adult type) or “nonischemic“. All cases related to children and teenagers are considered “nonischemic” cardiomyopathy. This type involves the heart’s abnormally thick structure and poor function that is put into two categories. The first is called “Primary Cardiomyopathy.” This is when the heart is the organ first affected, usually caused by infectious agents, auto-immune diseases, the build-up of proteins in the heart muscle called amyloidosis, and increased iron levels in the heart called hemochromatosis. It could also be caused by a genetic disorder such as fatty acid oxidation, Barth syndrome, or Noonan syndrome. It is necessary that any child diagnosed with cardiomyopathy be evaluated for suspected genetic disorders. The second is called “Secondary Cardiomyopathy” with the damaged heart being caused by complications from a different disease such as HIV, cancer, muscular dystrophe or cystic fibrosis. Cardiomyopathy is a rare disease when diagnosed in infants and young children. The majority of diagnosed children are infants under the age of 12 months with fewer cases between the ages of 1 to 12 years. It is the number one reason for heart transplants in children. According to the national pediatric cardiomyopathy registry, 1 in every 100,000 children in the U.S. under the age of 18 is diagnosed with primary cardiomyopathy. This number excludes the increasing number of children with secondary cardiomyopathy and the many that remain undiagnosed and asymptomatic. There are four types of nonischemic cardiomyopathy with the most common (58% of all affected children) being: Dilated Cardiomyopathy (DCM). 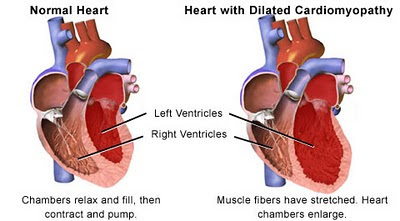 This occurs when the affected muscle fibers of the heart are enlarged and stretched (dilated) in at least one chamber. It begins in the left ventricle and continues to the atria as the disease progresses and the heart attempts to compensate for its poor contraction and severe stretching. The other four are: Hypertrophic Cardiomyopathy (HCM), Restrictive Cardiomyopathy (RCM), and Arrhythmogenic Right Ventricular Cardiomyopathy (ARVC). When an infant is diagnosed, it usually signifies a serious heart condition that requires aggressive treatment. It is unknown how the child’s heart muscle will react with each growth spurt that he/she goes through. When it is a severe case, children may have symptoms that progress rapidly and lead to heart failure. This is a much different scenario than with an adult diagnosed with cardiomyopathy who may have minor symptoms without any serious or major problems for years. Another reason for a child having such a serious heart condition is that cardiomyopathy is not usually detected until the end stages when obvious symptoms of heart failure are apparent. Cardiomyopathy can occur in any child regardless of age, race, gender or socioeconomic background. Recent studies show that children are about 10 times more likely to develop cardiomyopathy during the first year of life than ages 2 to 18 combined. Unlike other congenital heart conditions, there is no surgical treatment or cure that can repair the damaged heart or stop the progression of the disease. The first treatment option is usually medication to improve the functioning of the heart and for those with arrhythmias (irregular heart beat) an implantable defibrillator may be recommended. One of the most important reasons that I decided to include cardiomyopathy in children in my A to Z writings is because there has been little funding for any research for this disease. If you consider that the years of potential life lost in a child with a heart disease is 2-7 times that of an adult, we must question why the federal research spending is so disproportionate to the severity of the disease. The mortality rate for pediatric cardiomyopathy is higher than childhood cancer, and each year that number of children in the U.S. diagnosed with cardiomyopathy is three times that of pediatric AIDS and the federal research spending on pediatric cardiomyopathy is less than three percent of what other well-known diseases receive. Many years ago, an Australian teenager Fiona Coote was diagnosed with cardiomyopathy and the whole of Australia seemed to go through her surgery and recovery. She is still alive and doing well although I’m sure she has had another transplant. Thanks for letting me know about the incidence of this versus childhood cancer. It’s good to keep in mind. Yes. People often forget that it is not just a disease of adults. Of course, it is mush more prevalent in adults because of their life style or years of high blood pressure. But it is so sad for these little ones. Thank you for coming by and reading these articles and commenting. I thought it might be a bit dull for most people to want to read. You are so kind. You’re welcome. You never know who is going to read what we write and even though it might seem obscure at the time, for that 1% who is living with that condition, it is a light bulb moment. It means so much to know that tszomeone cares and acknowledges where they’re at. My daughter was diagnosed with mild gastroparesis recently which has a 1-2% incidence but one of the people I blog with has it and I’d encouraged her awhile back and she was so amazingly helpful and it was good to know someone straight away who had it and understood it and my daughter. I have dermatomyositis and tmy support group has a little wombat which they’re using to spread the word. He is traveling around and people photograph him. He is currently at our place and spent easter with us. 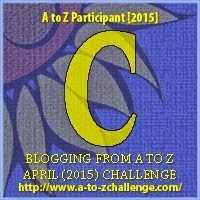 I’m a bit caught up with the A=Z challenge but I do plan to blog about him. Today, I am writing about Fred Frog and freaking out about the future. I was planning to write about the frog but have been feeling quite edgy lately, unsettled and realised that I’m freaking out about the future. After what I’ve been through, there just isn’t that certainty I used to have. That belief that if you work hard, persevere and focus that you will reach your destination without being side-swiped on the way. I guess this is what perseverance is all about…to keep going regardless. I’m sure these are misgivings so many of us live with and others would relate. You are right. We all are wondering what the future will bring, but I am sure that whatever it is, we will get through it all. Can’t wait to read about Fred, and also the wombat! I am glad you are bringing attention to this undersupported and devastating disease. Thank you so much Cindy. I am hoping to bring awareness to these diseases that people never hear of, unless they have a child of their own suffering. Thank you for reading and commenting.